I have been in a few different buildings in the last couple of weeks. A couple of weeks ago we had the Queen’s birthday celebrations. 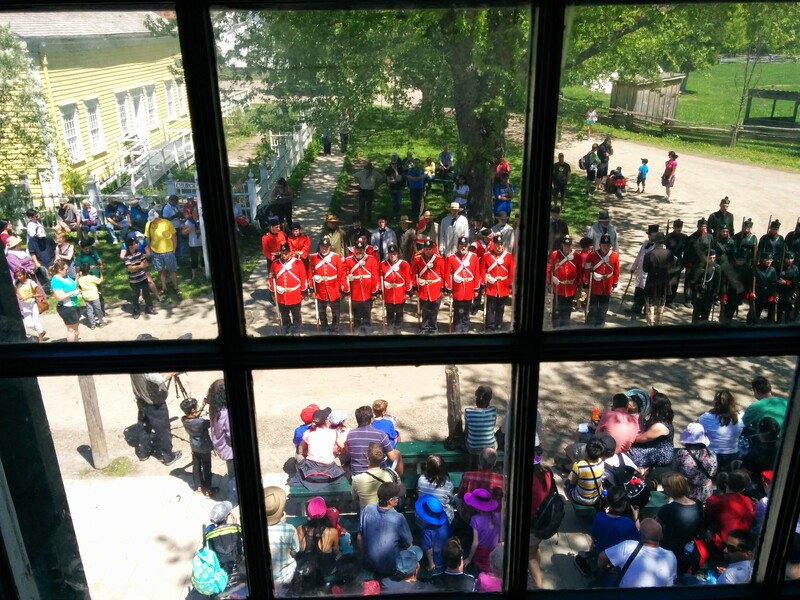 This picture was taken out of an upstairs window at Cooks Tavern where our village sedentary militia was assembled behind some visiting members of the Brockville Infantry and the Brockville Rifles. One thing that is GREAT for me this year is that my daughter, Heather got a summer student’s job at the village. It is an hour drive in each direction and it is wonderful to have company and someone to drive half the time. She is regularly on the miniature train, but about once a week she is being put in my old building, the woollen mill. She is obviously comfortable in there as she has known the guys for many years. My best friend at the village, Lynda has also just replaced me for the summer in the mill. 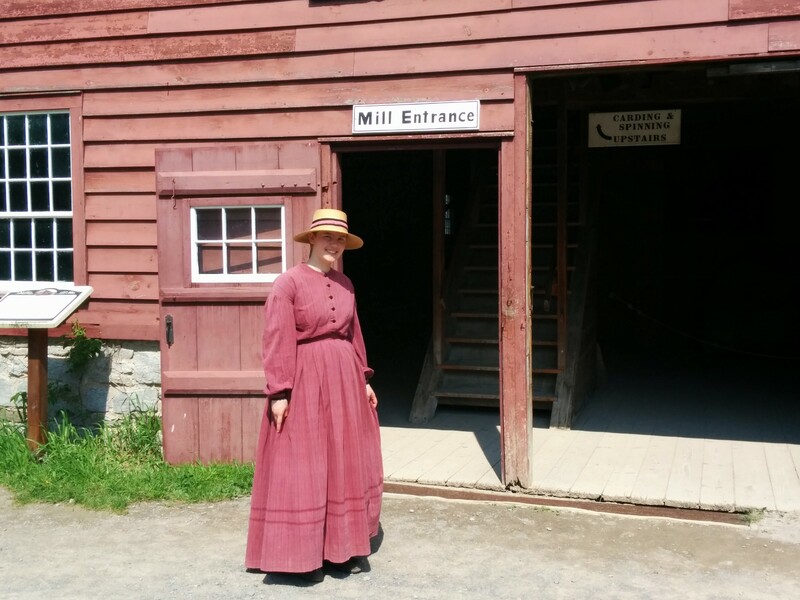 Here is Heather dressed for a day in the mill. Her dad took these pictures as it would have been much too public for me to. 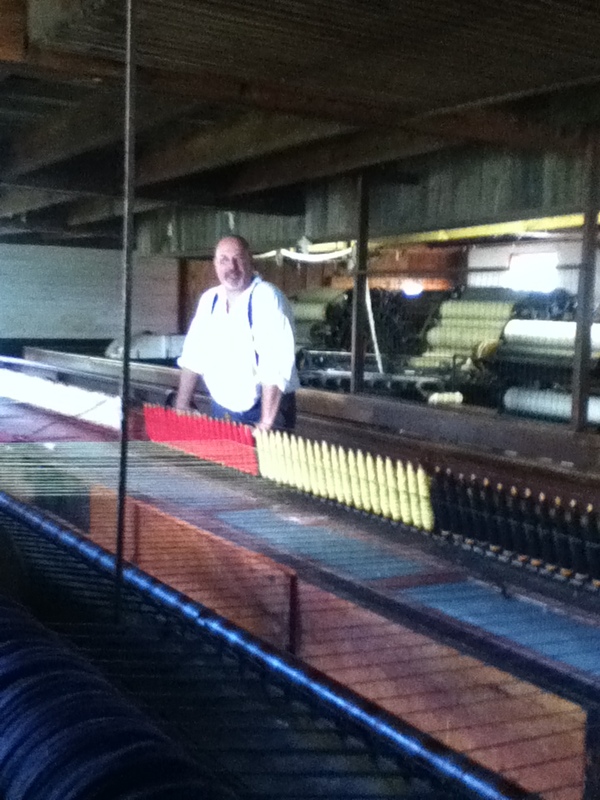 Last fall I did a temporary placement in the McDiarmid House, which is hand spinning and weaving. I am now going to be doing a day in there now and then when the regular artisan is on her days off. I was in there last week and I couldn’t resist going into the bedroom to take a picture of the young Brownies and Girl Guides as they trooped past. No pun intended. Really. 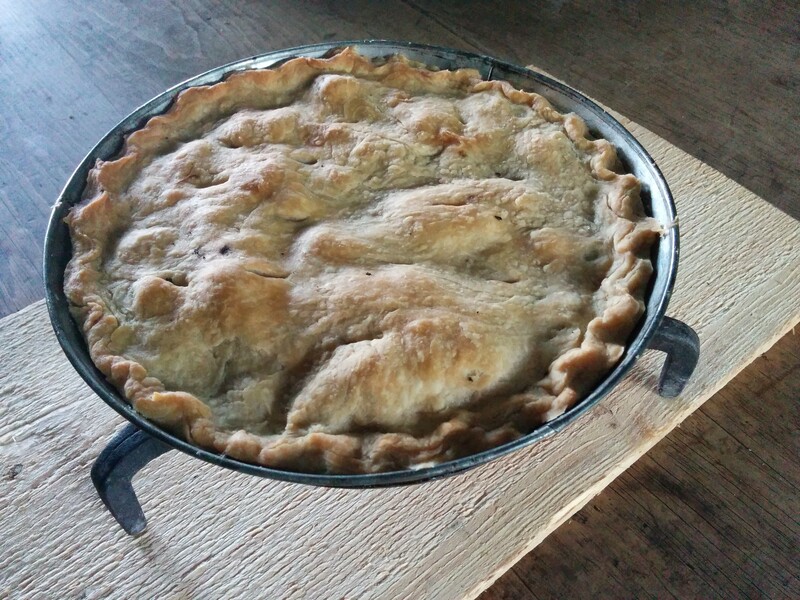 I made my first (totally passable) rhubarb pie in the bake kettle with no one else around to help me. I have used bake kettles before, but never without supervision. I was surprised how well it went and how straightforward it seems to be. Hopefully it wasn’t just beginners luck. 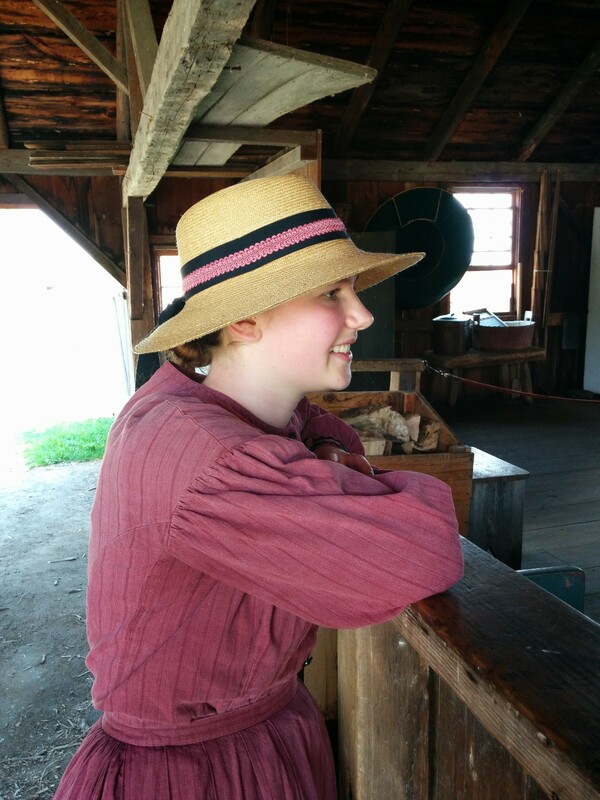 This entry was posted in Living history and tagged Upper Canada Village on May 28, 2015 by gillianknitter. I have been moving around the village a bit, things are unsettled in the first couple of weeks as staff shifts around and new people get incorporated. 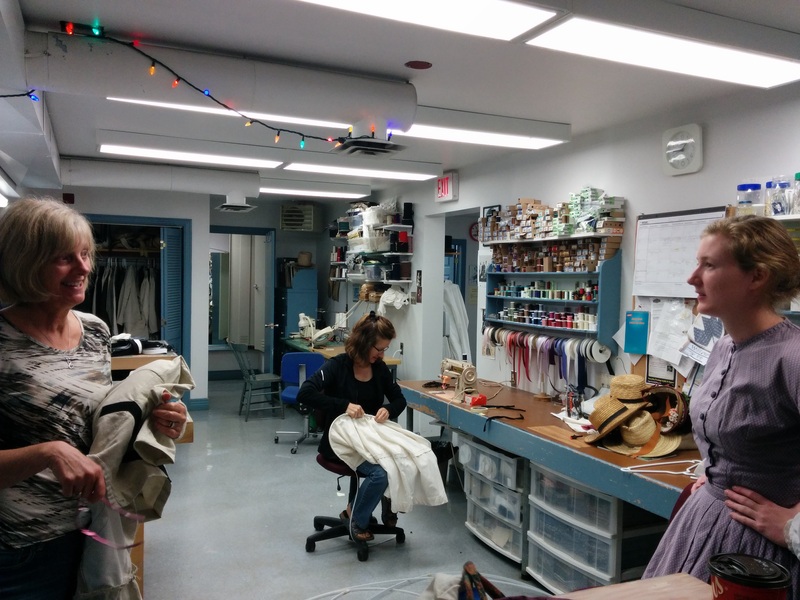 I had a visit to costuming so I could go into the flour mill in drag. They had me outfitted in less than five minutes. 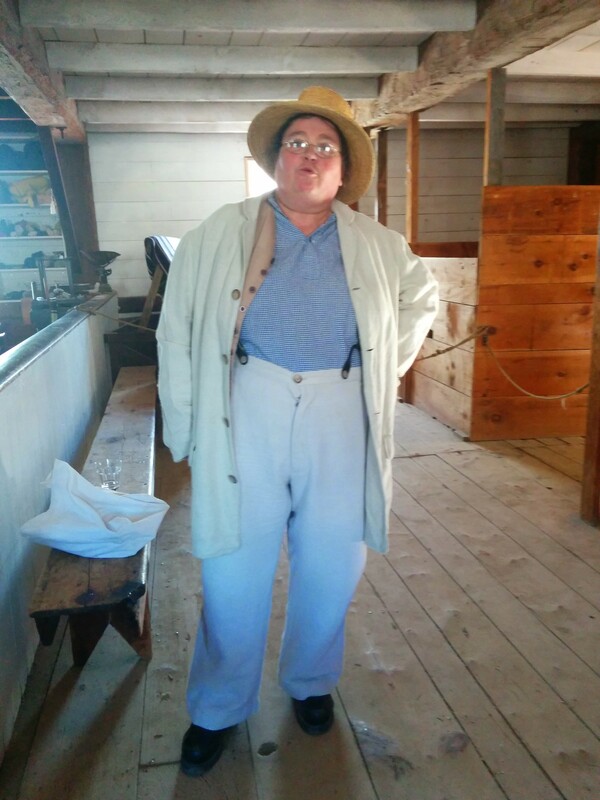 There is no real way to interpret around some positions as a woman, so we have to dress in men’s clothes once in a while and I spent that particular day in the grist mill. Costuming is always busy in the mornings just before work. They are standing by for mending, supplying hairpins, last minute re assignments that require special outfits, etc. 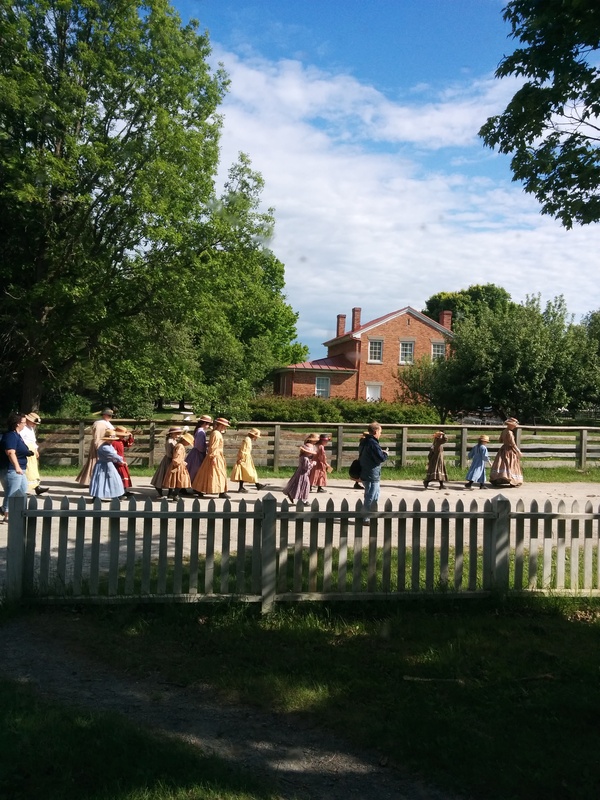 Later in the day they often have to outfit large groups of visitors that will be spending time on site in costume as part of their programs-overnight groups of school children and their teachers or girl guide troupes. Later in the season they have to outfit the kids from the overnight camps. Thirty kids a week with two complete outfits per child. They also have a lot of work to do on special event weekends where regular staff need clothes representing people of a higher social class than they usually portray, and visiting extras need to be clothed in period costumes. I enjoyed my day in the grist mill where they grind a hard, red Ontario spring wheat that is high in gluten and protein. 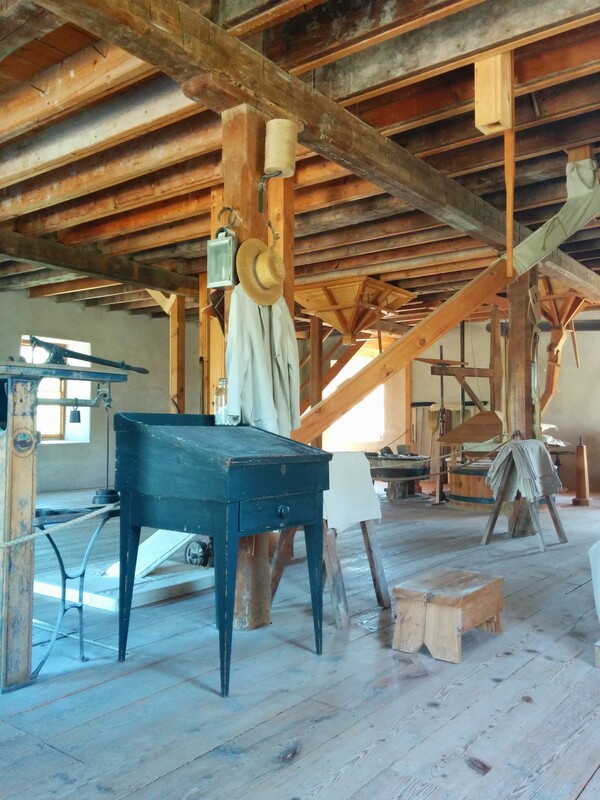 They produce flour for our on-site bakery and our gift shop as well as a few local bakeries who like the authentic stone ground flour our grist mill produces. It makes REALLY good bread that usually sells out at our gift shop, sometimes within minutes. I spent 4 days in my old job in the woollen mill, then moved into my new position in the cooking unit. I am at the completely opposite end of the village this summer in the kitchens down on the farms. 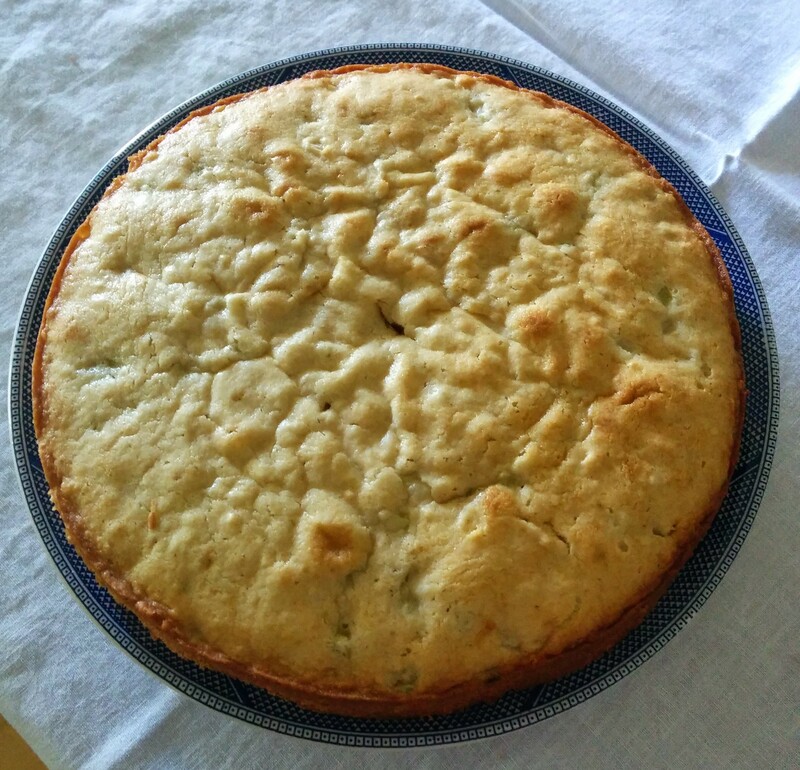 I baked my first cake in the wood cook stove and thankfully, it turned out fine..nice and moist and not burned, which had been my fear. This picture is before I added a brown sugar icing. 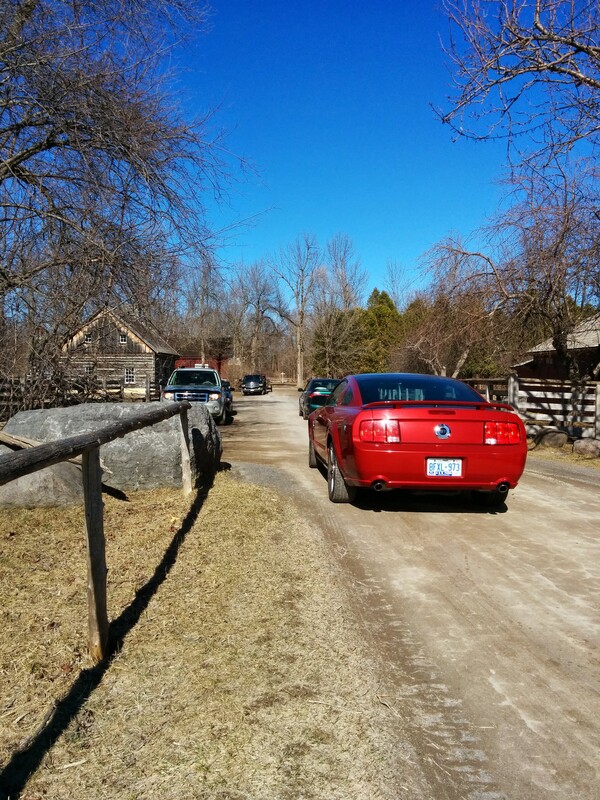 This entry was posted in Living history and tagged Grist mill, Upper Canada Village on May 17, 2015 by gillianknitter. A few weeks ago, we set up the houses at work for the season. Every year all the antiques are taken out of the buildings and stored for the winter. 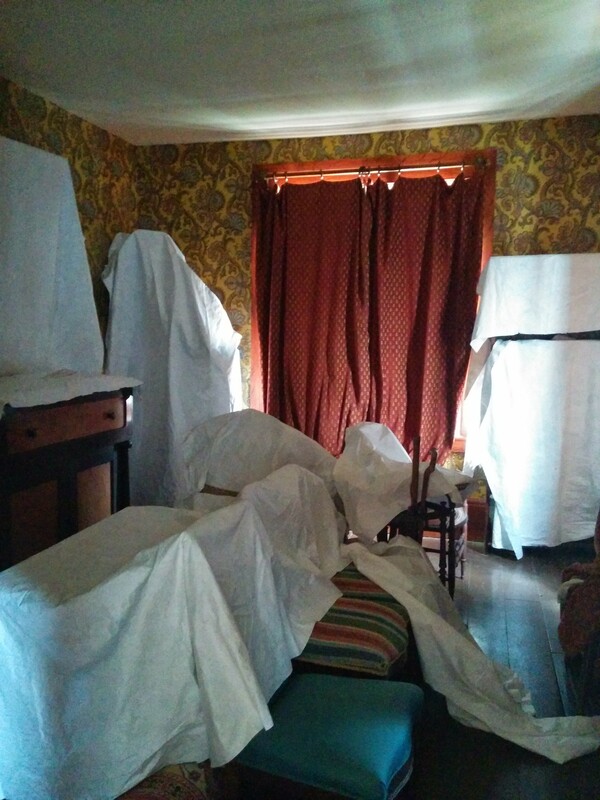 The houses are cleaned top to bottom, the carpets rolled up and the furniture draped in protective tyvek. We come back in the spring, clean again, return the antiques to their places and set everything up for the season. I took a before and after shot of one room, sorry the after shot is a little overexposed. 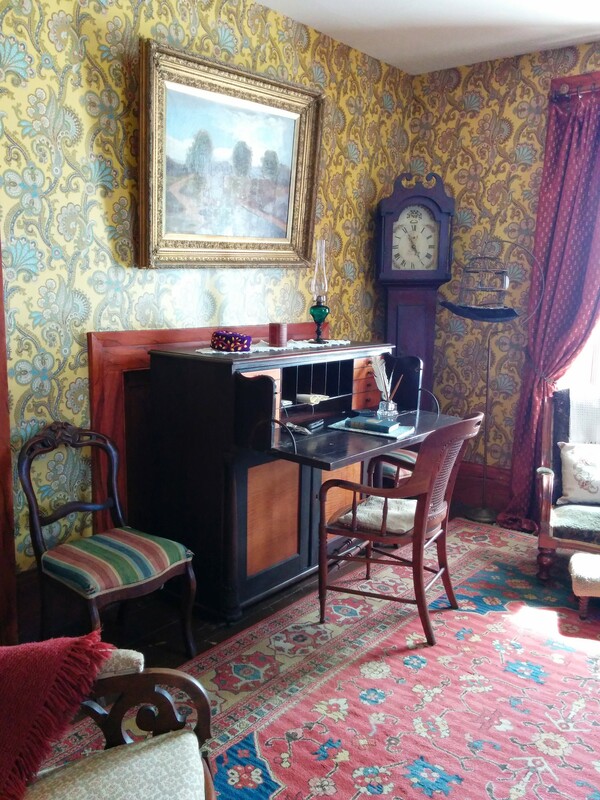 This is the sitting room at the Loucks farmhouse. On that same day a few weeks ago, I snapped a shot of the back street of the village just as everyone was leaving work. 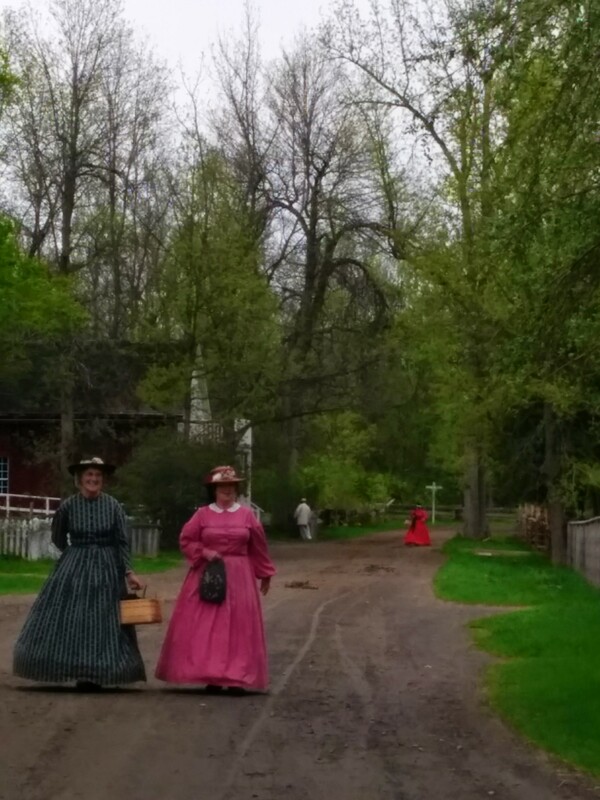 It does NOT look like your typical 1860’s street scene! For this shot, I was standing just beside the rock in the picture above. I remember once a few years ago when Alan drove me to work and I had stuff to move between buildings. He was horrified when I made him drive through the village in a car. I must admit, I like to walk round the village before work sometimes and the bucket lifts and pickup trucks do nothing to enhance the experience, let me tell you. Luckily for the visitors, we do everything we can to help them have an authentic 1860’s experience during opening hours. 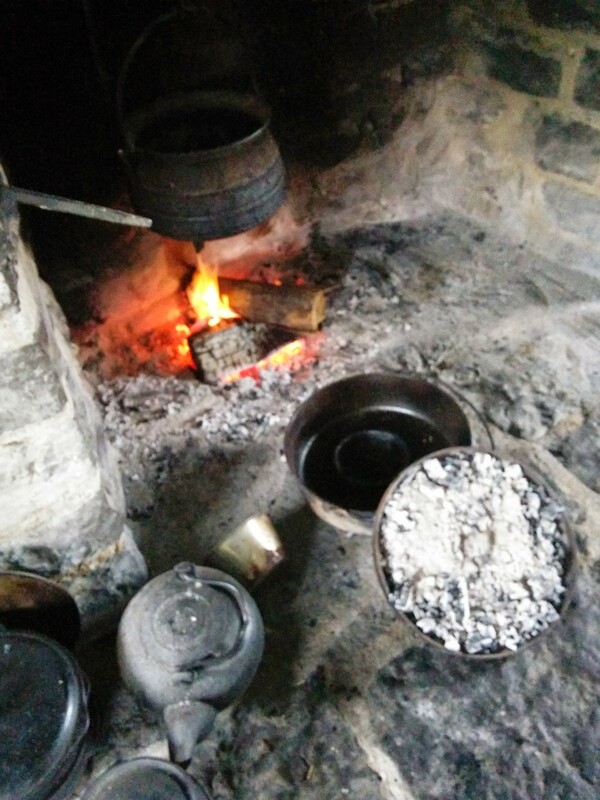 This entry was posted in Living history and tagged Upper Canada Village on May 10, 2015 by gillianknitter. 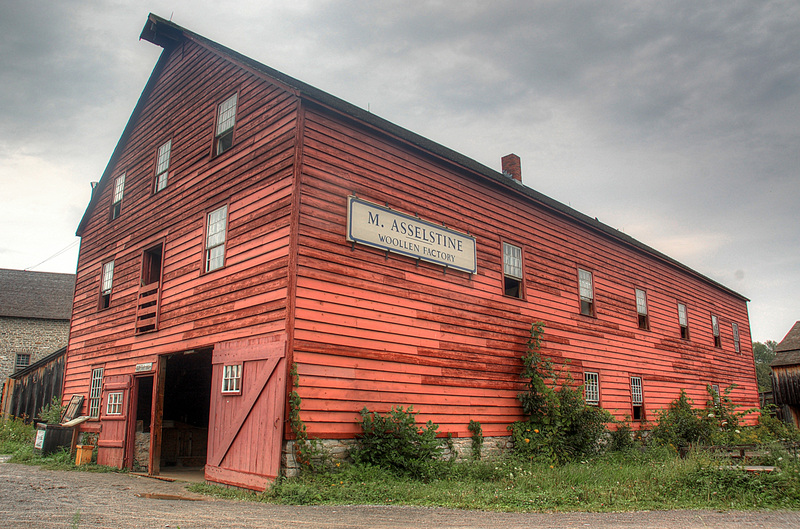 I work in the Asselstine Woollen Factory at Upper Canada Village. I have been working at the village for 7 years, and in the Woollen Mill for 4. We are a fully operational, water turbine driven woollen mill. We have all the machinery necessary to make blankets and knitting yarn. 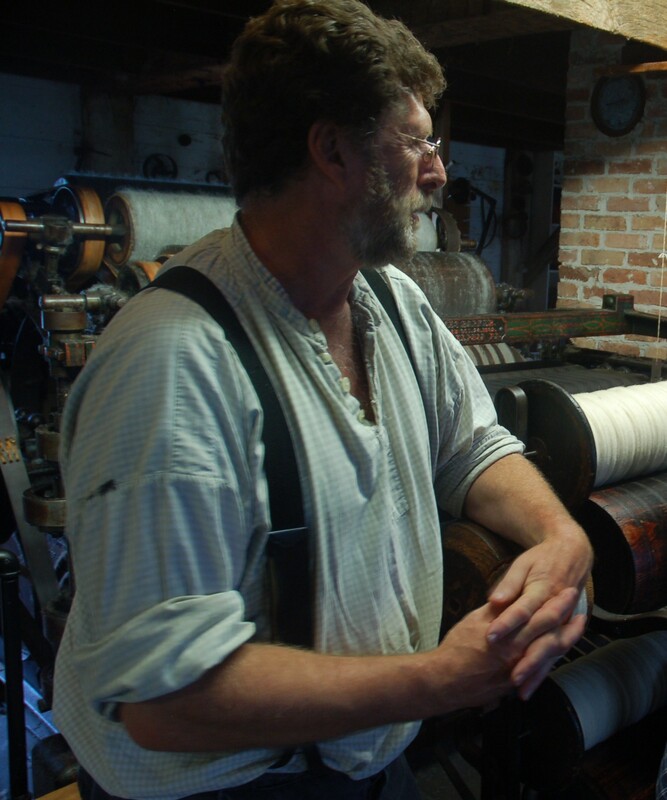 Our spinning jack and our set of 3 carding machines were manufactured in Massachusetts in 1867 and we also have a blanket loom from the 1840’s. I work with two men, Mark and Ron who maintain (read constantly have to troubleshoot) and run the machinery. I do the handwork…mending the blankets, tying the fringe on the ends of blankets, etc. I also run the doubling frame (plying machine) to make the knitting yarn over the lunch hour most days. This entry was posted in Living history, Uncategorized and tagged knitting, Ryan Gosling, Upper Canada Village, Yarn on November 30, 2013 by gillianknitter.